Move in ready April 2019. 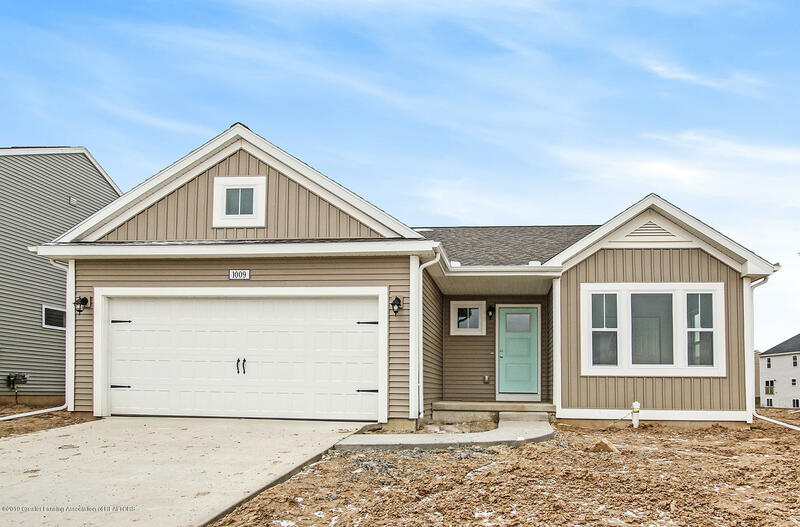 This new ranch has 3 bedrooms, & 2 baths in Meadow Woods East, a small community on the banks of the Grand River blends rural, small town and suburban living. Meadow Woods East, located in the Grand Ledge Public School District, is a small town that comes by its name honestly, with nearby sandstone and quartz ledges that provide some of the best - in fact, some of the only - rock climbing inMichigan. RESNET ENERGY SMART NEW CONSTRUCTION, 10 YEAR STRUCTURAL WARRANTY. Welcome home to the convenience of single story living! The open and spacious main floor offers a mudroom, laundry, open kitchen with breakfast nook and large great room. Kitchen and great room have vaultedceilings. This home is 33 yrs newer than most in its price range. Directions: From I96 take Exit 86 M-100/S Wright Rd., south on M-100 to W. Main St., right (NW) onW Main St., follow W. Main Street to Hawks Ridge Dr on right.